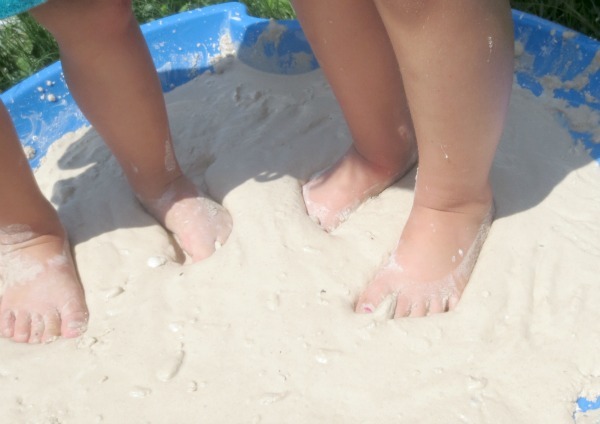 We have been playing and exploring with sand in all sorts of new and FUN ways, and I am so excited to share them here! 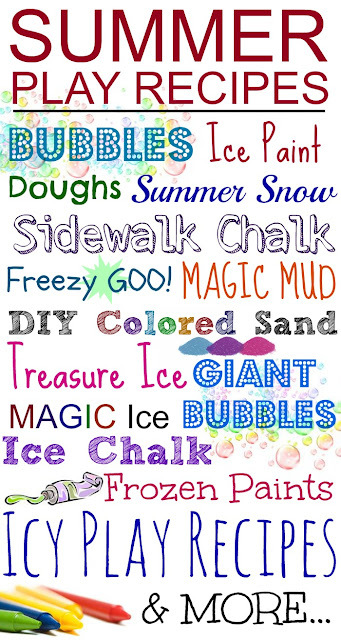 This first play recipe is one the kids can really sink into this Summer. 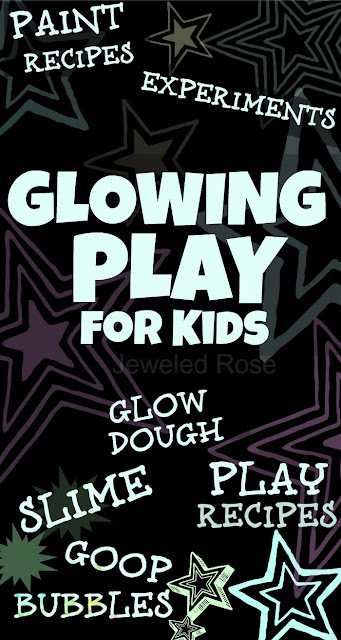 It is easy to make and lends itself to all sorts of play and discovery. What kid wouldn't want to play and explore in their own pit of quicksand? 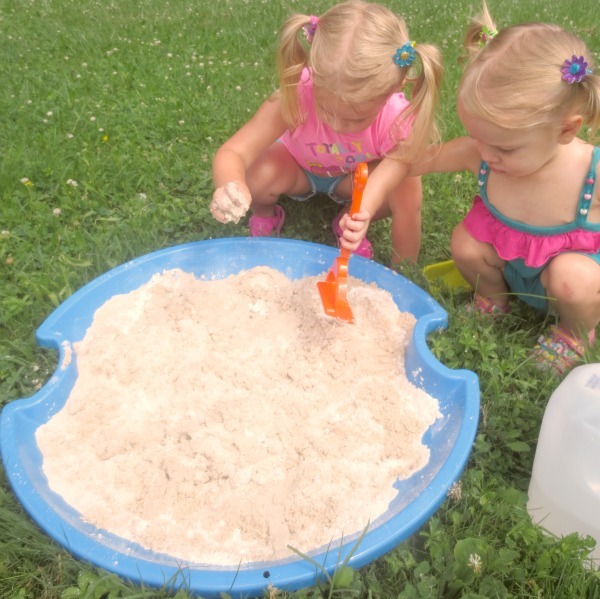 This homemade quicksand is easy to make and kept Rosie and Jewel happy and playing for a whole afternoon! Part of the fun of this play recipe is mixing the ingredients. We explored all sorts of textures on our way to getting the perfect quicksand. 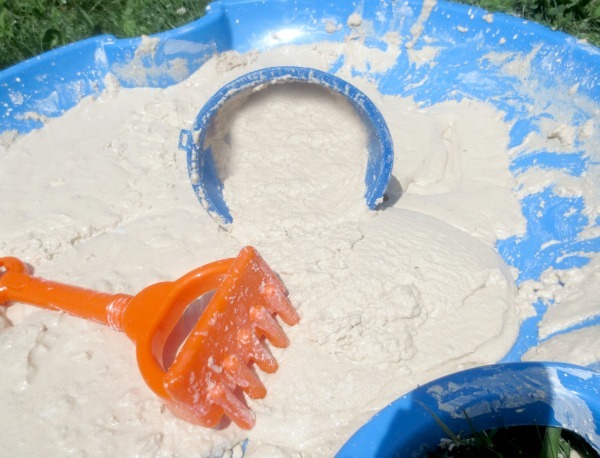 We started by combining one box of cornstarch with three cups of play sand. The girls had lots of fun playing with these dry ingredients to get them good and mixed. Then it was time to add water. We added the water a little at a time, and each addition created a whole new play material. Adding a little water gave us a hard, almost porcelain type of sand. Adding a bit more gave us a moon sand type consistency. Just a little more and we had the perfect quicksand. You can add a bit more sand for a grainier texture or a bit more cornstarch for more OOZE. 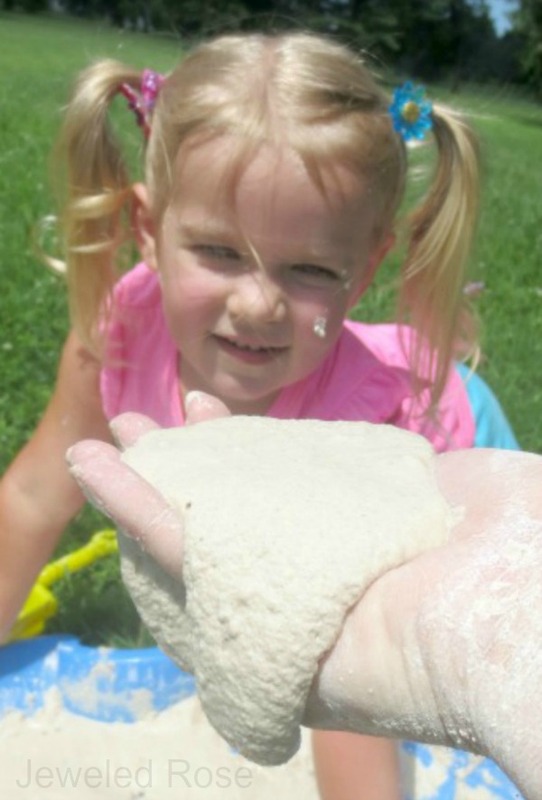 It is not an exact Science and exploring the materials is a big part of the fun. 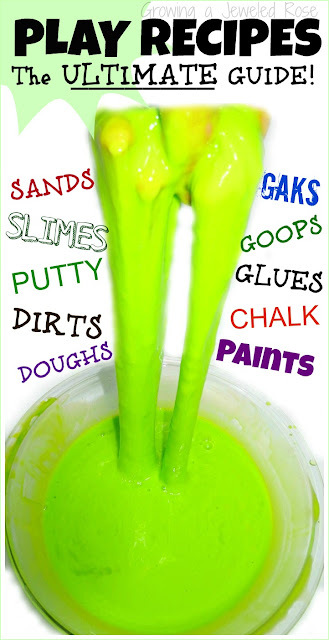 Play quicksand has a consistency a lot like GOOP only it is much more solid and the change to a liquid occurs more slowly. It also has quite a different texture and is more mold-able. You can walk across it's surface if you move quickly. However, if you move slowly you will sink. 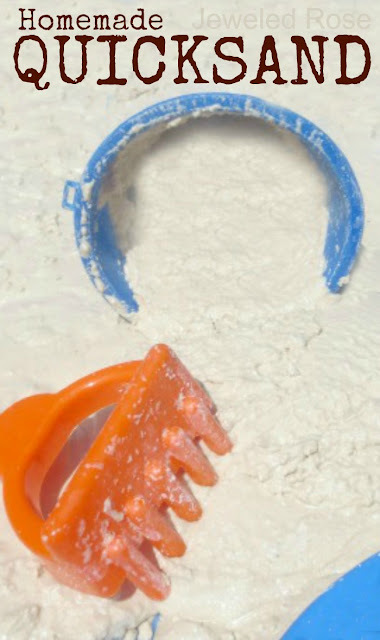 Lift the bucket quickly and you will have a super OOZING sandcastle. It will look just like a sandcastle for a second before it turns to an oozing tower. We lined our bucket with plain cornstarch to help the castles hold their form and not stick. 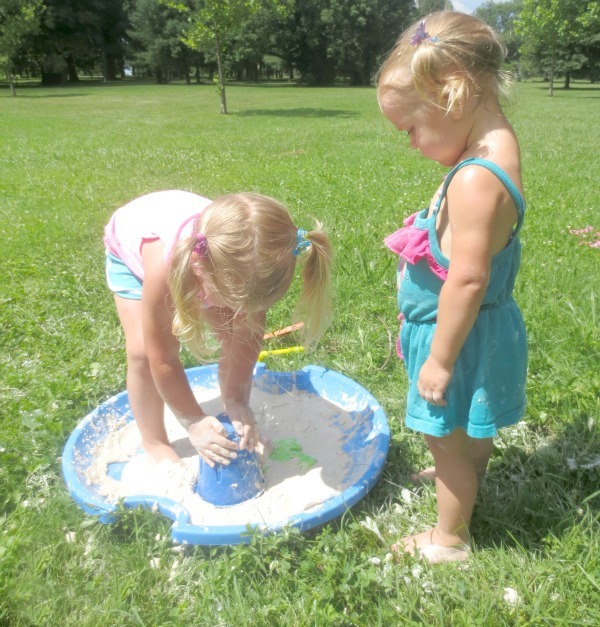 The girls loved their homemade quicksand. 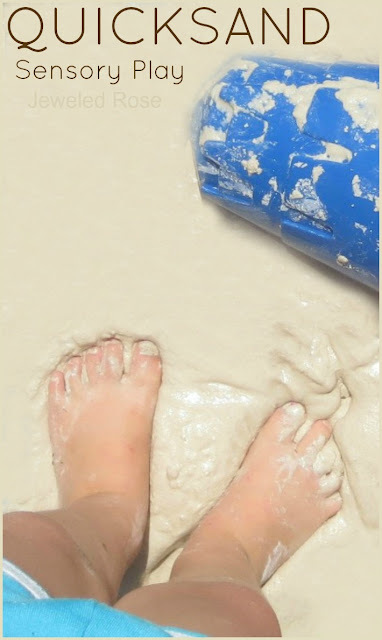 They had quicksand races, sinking races, made castles and played catch with melting sand balls. They found all sorts of ways to play! When the girls were through with their quicksand we placed it in a closed bin for future play. 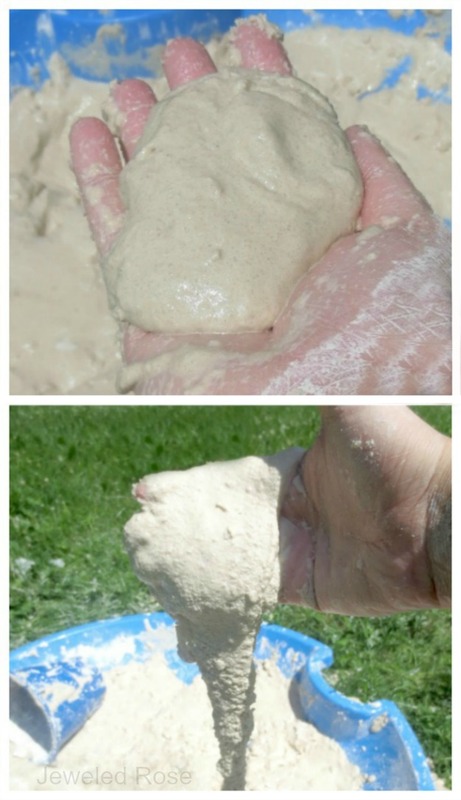 The next time we went to play all we had to do was add more water to our mixture. I am not sure how long we will be able to keep our sand, but given how inexpensive it is to whip up, even just a few playtimes makes it well worth it!